One cookie is good. Two cookies are better. Add chocolate ganache between two cookies and you’ve got something amazing. I first learned about confetti cookies from Joy the Baker. 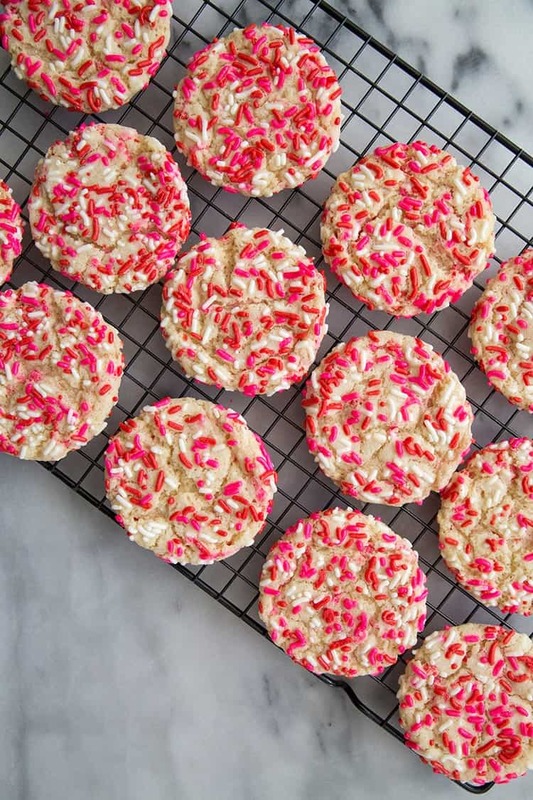 When I saw her vanilla bean confetti cookies, my eyes widened with excitement. It’s taken me two years, but I finally got around to making them. And oh boy, are they delicious! These are definitely my new go-t0 holiday cookies. Sprinkles needs no explanation. It’s good on everything, especially cookies. These cookies are so fun and festive. Depending on the holiday, special occasion, or random cooking making day, you can swap the appropriate colored sprinkles. While these cookies are more than fine on their own, I wanted to up the ante for Valentine’s Day. 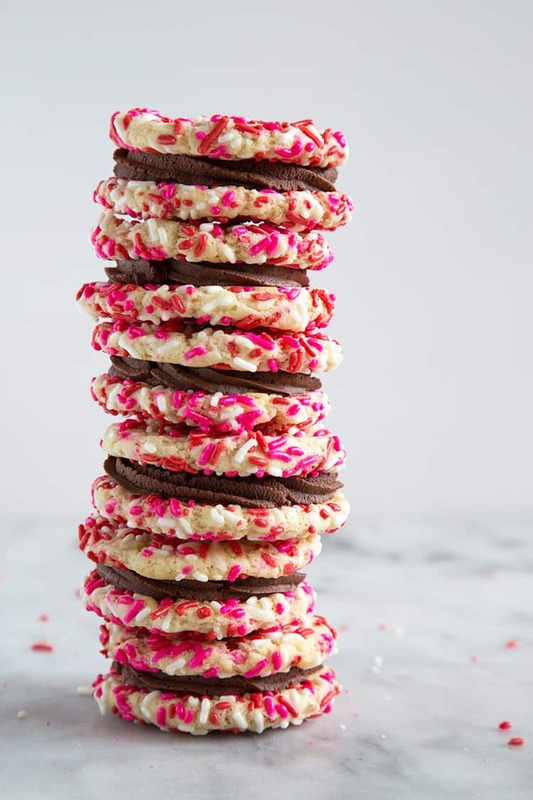 I would MUCH rather receive a box of these confetti cookie sandwiches than an ordinary box of chocolates. It’s homemade, pink, and filled with chocolate? SOLD. These cookies are so soft yet durable. They’re easy to bite through, making them the perfect cookies to make into sandwiches. Note: I used a small star tip (8mm) to pipe the whipped ganache. It’s best to use a small tip so you’re not overwhelmed by the amount of chocolate. I used my favorite chocolate ganache recipe. It’s the same one I used to frost my ultimate chocolate cupcakes. Although it is only comprised of two ingredients (70% dark chocolate and heavy cream), it requires a bit of patience. It takes about 60-90 minutes for the chocolate to firm up. You start by heating heavy cream to an almost boil. Then you pour that hot cream over a bowl of chopped chocolate. Let the mixture sit for 2 minutes undisturbed. Take a sturdy spatula and stir until ganache in homogenous. Leave the bowl of ganache out at room temperature. Stir it every 20 minutes for about an hour until the ganache has thickened substantially. It should have the consistency of play-doh. Then transfer to a mixing bowl and whip until ganache is airy and fluffy. Yes. It sounds tiresome and time consuming, but you can’t rush chocolate. Your best bet, start making the ganache while the cookie dough is chilling in the fridge. By the time you’ve baked off the cookies, the ganache will be ready. 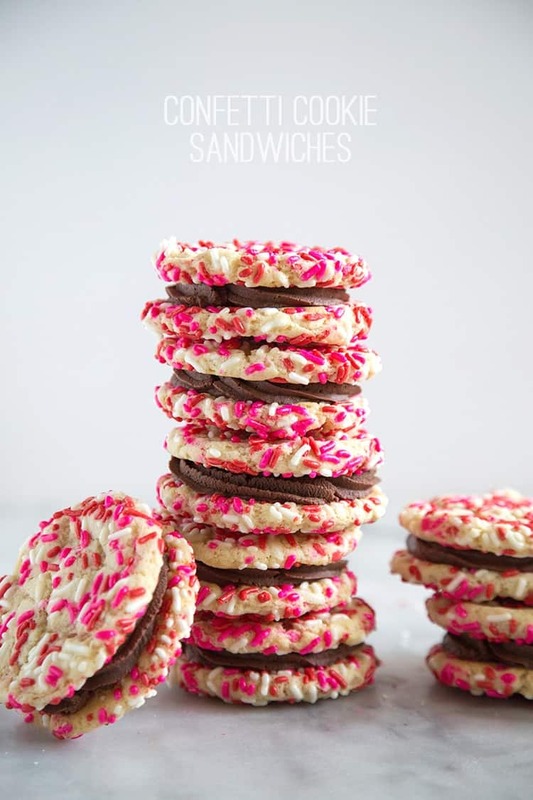 These confetti cookie sandwiches are dangerous. I started to nibble on one and the next thing I knew, I had finished it. In a large bowl, whisk together flour, baking powder, cream of tartar, baking soda, and salt. Set aside. In the bowl of a stand mixer fitted with a paddle attachment, heat butter until smooth. Scrape down the sides of the bowl. Add sugar and vanilla and mix on medium speed until combined. Add egg and mix until incorporated. Slowly add the flour mixture in three additions, mixing on low speed. When the dough is almost thoroughly combined, add in 1/4 cup sprinkles and continue to mix. Using a 1-1/2 Tbsp cookie scoop, portion out the dough. Place remaining 1/2 cup sprinkles in a bowl. Coat cookie balls in sprinkles and place on a parchment line tray. Cover sprinkle covered dough with plastic wrap and chill in the fridge for at least 2 hours (up to overnight). Dough must be properly chilled to prevent cookies from spreading too much in the oven. Preheat oven to 350 degrees F. Place chilled cookie dough on a parchment line baking sheet. Arrange cookies about 2-inches apart from each other. Bake for 10 minutes until cookies are set along the edges. Allow to cool in pan for 5 minutes before transferring to a wire rack to cool completely. 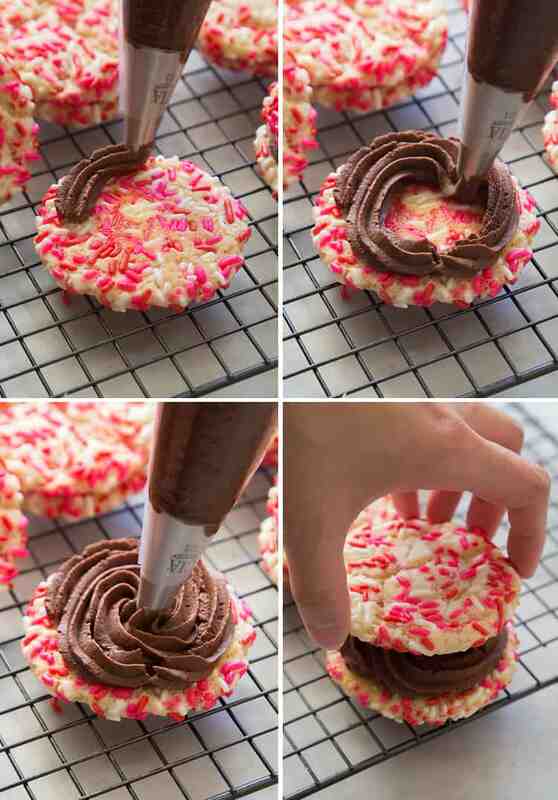 Fill cooled cookies with ganache, sandwich, and enjoy! Place chopped chocolate in a medium bowl. Heat cream until simmering. Pour cream over chocolate and allow to sit undisturbed for 2 minutes. Using a sturdy spatula, stir until ganache is homogenous. Leave ganache at room temperature and stir ganache every 20 minutes for 60-90 minutes until ganache has thickened substantially. It should have the consistency of play-doh. Place ganache in the bowl of stand mixer fitted with a whisk attachment. Whip on medium speed until ganache is airy and fluffy. Transfer to pipping bag fitted with a small star tip and pip into cooled cookies. Note: Filled cookies should last a few days at room temperature in an airtight container. So PERFECT for Valentine’s Day Maryanne! Valentine’s Day is one of my favorite holidays. These will be whipped up for sure! oooh, whipped chocolate ganache! it looks so creamy and decadent from your pictures (: not to mention that they look so festive, maybe even for the lunar new year (with that red going on especially). Sprinkles! And again, I shout….SPRINKLES! These little cookie sandwiches are so cute and delicious looking! 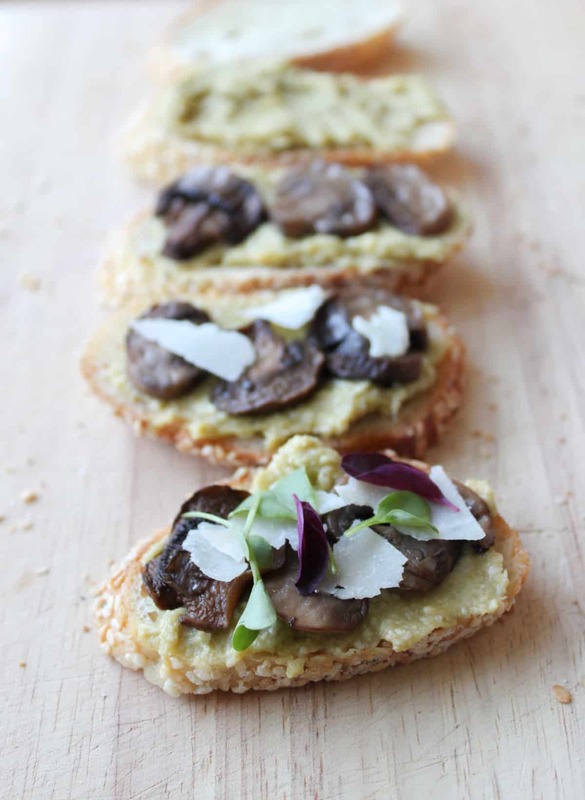 These look amazing – and I totally agree, 2 cookies are indeed better than 1!